With Beamer TV, families can experience the joys and benefits of videophone calls by seeing family and friends they are talking to displayed on their television screen. 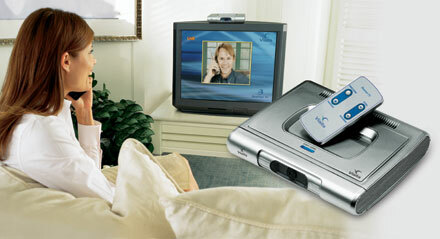 Beamer TV is easy to set up and easy to use - as easy as making a phone call. Works with any home phone (corded or cordless). Works with any standard (analog) phone line. One button gives you instant live color video. No special wiring or equipment. No service fees, contracts or subscriptions. No additional cost to your phone call. * NTSC is the television format in the United States. Almost all of today's televisions have RCA video jacks. For televisions that do not have RCA video jacks, use a RF modulator to connect Beamer TV to the television. Beamer TV is easy to set up in four simple steps. 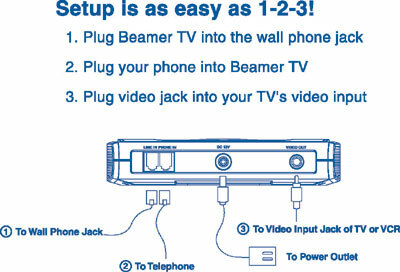 Plug your phone into Beamer TV, plug Beamer TV into your television's RCA video jack, connect Beamer TV to your wall phone jack, and plug in Beamer TV's power adapter. Beamer TV's performance features offer callers a wide range of choices. START/VIEWS button gives you complete control over when the video is on. Three viewing choices - Self view, Other Party view, or Combo view. Snapshot/Privacy option - send a high resolution video image and temporarily halt any new video transmission, until you want it to continue. Detail/movement control to select the degree of definition. Simple 4-button remote control for all Beamer TV features. Beamer TV is stylishly designed to fit anywhere. With a slim, sleek shape and lightweight body, Beamer TV is ideal for any viewing environment. Trim, thin design (1.5"H x 7.6"Wx 6.0"D) allows Beamer TV to fit easily into small spaces. Skid-proof base keeps Beamer TV securely positioned atop any television. Adjustable tilt camera makes it easy to capture the perfect view. Camera cover hides camera lens when not in use. Remote control nests in recessed niche, making it easy to find. Beamer TV is designed to add live, color motion video to phone calls using any home phone and television (with RCA video jack), over any home (analog) phone line. The quality of the video connection is dependent on the quality of your phone line connection, just as the audio quality is dependent on the phone line connection when Beamer TV is not in use. Q: Do I need any special equipment or service to use Beamer TV videophone? A: No special equipment or wiring is required. All each person needs is a home phone, a home phone (analog) line and a television (NTSC or PAL format) with a RCA jack. Analog phone lines are standard for almost all homes in the U.S. If you are unsure of what type of phone line you have, contact your local phone service provider. NTSC is the only television format in the US and almost all of today's televisions have RCA video jacks. Q: Is there any extra cost to the phone call when using Beamer TV videophone? A: No, because Beamer TV uses an analog phone line there is no additional cost for a Beamer TV videophone call. Beamer TV is designed to work with your current phone service for the same cost as a regular phone call without Beamer TV. Q: Does Beamer TV videophone work with special phone services? A: Beamer TV is designed to pass the Caller ID information to the telephone connected to Beamer TV. Your Caller ID information will show up on your telephone, just as it would without Beamer TV. (Caller ID is a subscription service offered by your local phone service provider.) At the present time, Beamer TV does not support Call Waiting or 3-way calling. A: Similar to when you place a regular phone call, Beamer TV's video quality depends on a number of variables including the quality of the phone line connection. Changes in the quality of the connection will impact the quality of the video. If you have a normal or good phone line connection, you should see a clear, color motion video of the person you are calling, including details like changes in their facial expression. Q: Will I be charged extra service fees when using Beamer TV videophone? A: No, with Beamer TV, there are no monthly fees, service plans or hidden costs. There are no additional fees associated with using Beamer TV.